The Beast Among Us immediately opens on a bad note with the obligatory "badass monster hunter origin story" which you've seen a million times (and which I already covered on my last werewolf movie review, Red: Werewolf Hunter) - a family locks themselves up to protect themselves from the monster, but it breaks in, kills the family, the kid manages a lucky kill and then we get a time-skip. It's basically the easiest way to establish a "badass" character and lets the audience infer basically everything they need to know about them, but good God has it turned into a lazy shorthanded trope. From there, we skip ahead to some unspecified time in the mid-to-late 1800s where we get introduced to the kid from the opening sequence, Charles, who is now all grown up and is the grizzled leader of a werewolf hunting group. This group are all colourful and distinct characters... archetypical, but distinct at least (you've got your drunken badass, heavy gunner, the hot action girl, the shady guy, etc). As fun as seeing werewolf hunters in action could be, I was worried pretty much right off the bat that Charles would be a crappy protagonist because he tries so hard to be badass that it could have been cringy and campy instead. Luckily, the film seems to have anticipated this and wisely went for a "less is more" approach, making him more of the idealized side-character everyone looks up to. It also doesn't help that the film really bungles fleshing out any of the characters, especially in the hunting group (again, they're mainly just a single character trait each rather than characters). The only one with any real development is Stefan (the previously mentioned shady guy), but that is simply because the film wants to utilize him as an obligatory secondary antagonist. Luckily, the film instead chooses to make its protagonist a doctor's apprentice named Daniel, whose village is under attack by an unusually powerful werewolf. He isn't an amazing character either, but he's definitely the most interesting in the whole cast, makes a good audience surrogate and is someone who you can empathize with. Unfortunately, his love interest, Eva, does not share that same fate, being relegated to the most boring and generic of generic love interests imaginable. Other than that, there's Daniel's prostitute mother, a doctor whose name is literally Doc, a stressed out mayor and a con-man hunter named Jaeger (who is actually rather fun to watch). Anyway, The Beast Among Us starts out really poorly, introducing us to the hunters and to Daniel and Eva, without really giving us a sense of who is who, and jumping between these two perspectives in a confusing manner. In fact, the first 10-15 minutes of the movie are quite difficult to follow, mainly serving to establish the nature of this world that we're exploring - there is a blight of werewolves on the countryside, people are being slaughtered by them, the citizens will slay those who become infected without mercy, and there are groups of hunters tracking the wolves down to keep people safe. 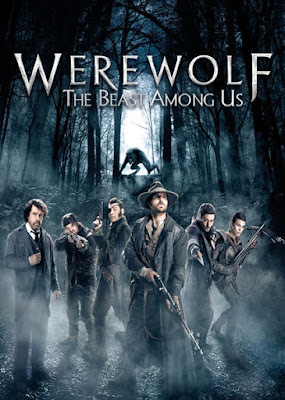 The film also establishes that there's a new breed of werewolf that is breaking the usual rules of lycanthropy in this universe (namely, that it can transform without the full moon) that has been attacking Daniel's village, which prompts the hunters to lend their services (in a scene which toes the line between a Jaws rip-off and "homage"). Wanting to see the deaths end, Daniel offers his services to the hunters, who accept with much reluctance. The Beast Among Us very much looks and feels like a TV movie - a fairly professional and high-quality one, to be fair, but a TV movie none-the-less. That said, it is surprisingly gory. The opening segment of the film establishes how brutal the werewolf attacks are by having mutilated corpses strewn across the streets, forest and falling out of ravaged carriages. Hell, there's also a scene where Doc and Daniel realize a man they are trying to treat has been infected by lycanthropy, so Doc pulls out a pistol and blows his head off. If you're looking for buckets of blood, then this film will deliver in that regard. One unfortunate aspect of the film is that its werewolf is largely realized through CGI. Again, it's certainly better looking than Red: Werewolf Hunter, likely due to Universal's involvement in this film's production, but it still is a far cry from Dog Soldiers or An American Werewolf in London... or, hell, The Wolfman remake. The filmmakers do show some restraint though, as the CGI is mostly used in shots where the werewolf is moving and attacking. There is also a practical costume which is used at times when we're actually supposed to empathize with the werewolf, which definitely shows some wisdom on the part of the filmmakers and suggests to me that they knew that the CGI was going to be inadequate. The costume actually looks pretty good too, it's just a shame that they couldn't find a way to use it more throughout the film. Anyway, I don't want to totally spoil the film because for all its problems The Beast Among Us is a reasonably entertaining film with a couple good twists, but it also fails to really leave an impression on you when it's over. It's literally forgettable... and I'm not exaggerating about that either. I set up the start of this review to imply that this was the first time I had seen this film, because I honestly thought that it was. However, when I went to go rate it on IMDb afterwards, I saw that I had already seen this movie 5 years ago. Like I said, this film had a couple good twists and isn't even all that bad, but I had completely forgotten that I had ever seen it - The Beast Among Us is that generic and that mediocre that I never even had a feeling like I might have seen this before. I couldn't even remember who the main character was going to be or who the werewolf was all along. That's actually what prompted me to write this review, because it's interesting how forgettable movies work - I'll never forget any of The Howling films (even the fourth one, in which literally nothing happens until the last 10 minutes), Project X or Troll 2, because they at least manage to stick with you afterwards. However, a film that doesn't fail hard enough, or which fails to do anything but stick to bland tropes is harder to recall and may just be the worst fate that can befall a movie. Like I said, The Beast Among Us is a reasonably entertaining film, but it will not stick with you afterwards. It never really rises above mediocre, but it's worth the watch if you're into werewolf films and have a lazy weeknight with nothing better to do.